It has been almost 3 weeks since Ryan started school. Does he like his school? The answer is yes. He absolutely LOVES school. He can be so enthusiastic about school up till the extent he would tell me he wants to go school NOW eventhough we just got in the car on our way home from school. He will tell me who is who is his best friend, who is his fav teacher, whether he did go to the gym etc etc. His comprehension of the second language (mandarin) also markedly improved. He used to be very advese in learning new words but now he seemed more open. Last Friday Ryan’s school allowed a casual wear day inconjunction with the Chinese New Year celebration. Most of the kids came in their chinese traditional wear. They all look absolutely adorable and gorgeous. Last Friday I went to fetch Ryan from school as usual. However, unlike any other day, that day I was greeted by a smiley tot running out of the classroom after spotting me, holding a handmade CNY card and wished me “????”.. and yes.. that was my boy. It was indeed special. That certainly made my day. Last but never the least, here’s wishing all of you a Blessed and Happy Ox-picious Year too. The first few days of school…. Ryan turned 33 months today and what a day to remember. Today, being the 7th day at school, finally he stopped crying. He was close to tears but he held back. He actually said ‘okay mommy‘ when I told him I’m just going to stay outside the door to take pictures and videos of him. We gave each other goodbye hug and a kiss and I walked out of the door. I was actually anticipating his cries but VOILA .. to my pleasant surprise, he shed no tears today. Infact he got busy right away, checking out the toys, puzzles what not while the teachers were busy settling down other crying babies. Ngek ngek ngek.. Bravo Ryan!!!!!!! Mommy is sure proud of you!!!!! Ryan started his first day at school on the 8th Jan 09. I was so anxious about the whole thing that I didn’t sleep well the night before. That morning all of us woke up around 7.15am. Daddy had taken leave to accompany us to the school. We reached the school around 8.15am. Since N1 (3 year olds) students will only attend Circle Time Term 2 (obvious reasons) so we need not go to the assembly hall. Instead we got straight to the classroom. Ryan was very happy in class which I am not surprised since there were many toys and books laying around. He helped himself with the trucks, puzzles etc. Of all, he was particularly fond of the horsy toys. I don’t know why but he like them so much he wanted to bring them home. 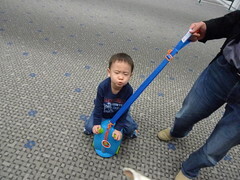 Ryan truly enjoyed songs and stories time. Well, sessions like these are not new to him so I guess he probably feel a sense of familiarity. On this day, both hubs and I stayed with him throughout the 3 hours. To my relief, he was able to take on instructions well and answer when teachers asked him question. Save me from worrying he wouldn’t be able to express himself. Teacher was quite amazed at how well Ryan behaved and actually said this boy is one independant boy. Hahaha.. let’s see. Day 1. Looking a bit scared and lost when we first arrived…. On day 2, the crying started. No.. not Ryan. Some kids started crying because they simply refused to get into the classroom even under the parents/guardians companion. Of course some parents have chosen a more cruel but effective way to cope with separation anxiety by leaving their kid with the teacher right from the start. For me, I chose to stay. 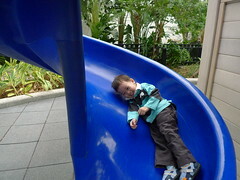 Again, Ryan behaved well throughout the class and participated in the activities/games. I did try my luck a few times by leaving the room. I told Ryan I’m just going to the toilet and will be back in no time. He said okay… but when reality hits and he realised mommy is no longer in sight, the crying starts. Poor boy. So on day 2, I actually stayed with him most of the time. Day 3 was the last day parents are allowed to stay on in the class. Today I refused to let Ryan cling on me. I stood at the back of the class and asked him to participate and do everything on his own. It was quite difficult at first as he kept running back to me for comfort but after a while he got the hint. Occassionally he turned his head to make sure I was still around. That night, same like the previous nights, I continue to tell him about stories of school, his friends, etc etc etc.. and showed him the videos and pictures I took. Day 4, the nightmare began. Parents were asked to leave the room after their first toilet break. There were so much cryings everywhere (from other classes too) that I thought it’s going to bring down the whole school. I told Ryan I will go out to buy a pressie for him and will be back by 11 o’clock (no.. he doesn’t know how to read the time but I have been teaching him to recognise 11 o’clock). Expectedly Ryan was okay for the first few mins but when reality hits again, the wailing starts. Sotong couldn’t contain her tears. I almost cried myself but I controlled and held back my tears. I even told Sotong, “it’s okay.. it’s natural for kids to cry. This is a phase all has to go through”. I want to laugh now that I think of it. Did I actually say that?? LOL. I stepped away to the canteen as the crying was just too much to bear. Sotong was tasked to monitor Ryan and text me with updates every 15 minutes. After about half hour, I got the long awaited sms from Sotong. Ryan had stopped crying. So does everyone else. Phew….. great relief! When I picked him up after school, his eyes were a little puffy but he still gave me the biggest smile of his when I showed him a Pooh bear which I bought from Popular bookstore in the school. Well, I kept my promise on the pressie bit. Day 4. Being comforted by one of the teachers (Liang laotsi). While some were just sobbing, this boy was definitely screaming his lungs out. Sobs…..
Day 5. I brought him to the school playground before class starts in hope to settle him better. He was all happy jolly until the minute we reached the class. Right after we stepped in, he clinged on to me like a koala. I thought to myself, sigh.. another crying episode. The teacher tried to coax him but to no avail. I have to toughen up. After a hug and goodbye kiss, I left him with the teacher and left the room. I hid around the corner outside the room and peeped at him. My heart breaks again. Yes. Another crying episode indeed. Again, I stepped away and asked Sotong to update me every 15 minutes. I went to the canteen and joined other heart breaking mommies pouring our hearts out. 30 mins later, the sms came. Ryan stopped crying. Phew… I bought him a small little pressie again to cheer him up after school. I know.. bribery is wrong… but it works wonder you know.. whatever it takes to get a smile on the little fella’s face. Day 5. Participating in one of the story telling. I wonder what was he telling the teacher. Ryan did better in school on day 6. Although he still cry when I left him but the extreme of it was much much milder. To my relief, he only cried for 10 minutes. I monitored him for a short while after which I decided I should go home for a good break myself. We didn’t go playground today. Instead I brought Ryan to see the fountains near the school’s canteen. He loves water. Today, day 7th. Ryan earned a perfect score from mommy! No crying! He actually gave me a hug and kiss before saying goodbye. I asked Mrs Goh (English teacher) how did it go with Ryan today. The feedback was good. She said Ryan did very well in class. He’s always keeping himself busy. He’s a very curious boy with an inquisitive mind and he asked a lot of questions. Ryan is also good with blocks (finger training). Day 7. at the outdoor playground. It has been a long and exhausting week but I feel extremely good today. It’s like seeing all the hardwork finally bearing some fruits. I definitely feel on cloud 9 today. Have a good weekend everyone. December was quite a relaxing month. Hubby was asked to clear his leave and we couldn’t be more happy when the HR told hubs in addition to his annual leave he gets additional 3 days child care leave that he needs to clear. Yea.. thanks to the govt’s recent ‘baby boom’ initiative (in Singapore, all working parents are entitled to additional 6 days child care leave). 10th – 14th December: Hong Kong Trip. We had a fabulous 5D/4N trip to Hong Kong. Ryan deserves a pat on the shoulder as he behaved extremely well throughout our stay. The only difficulty we had was with his food intake. He was extremely picky. He ate bits of this and that but generally I think he pretty much survived on milk. We departed from Singapore Changi airport at 9.30am. Ryan did not nap the whole 3.5 hours flight. We had wanted him to take a power nap but this boy was too excited to even wink. 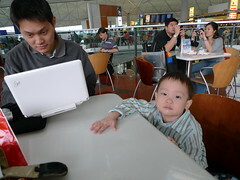 So we kept him busy with his Ultraman shows on our netbook while we eat our food peacefully. 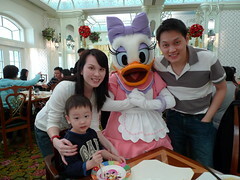 First stop was Hong Kong Disneyland. After about 15 mins coach ride, we arrived at our destination; Hong Kong Hollywood Disneyland hotel. 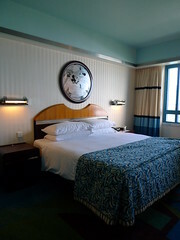 We have chosen this hotel for their Mickey Mouse themed designs. By the time we settled all the check in etc, it was about 2.30pm. The room was nice and clean but really nothing to shout about. To me, it’s just an overly priced regular room. Anyways.. we were all too tired to go anywhere. We all agreed nap was what we needed most to recharge. Such lazy family eh. Hehehe..
By the time we woke up it was about 5pm. 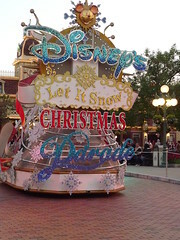 We got ready and went to the Disneyland Park. By the time we reached the park it was almost dark. We rented the stroller (HKD60 per day) and since it was approaching 6pm, we moved on to pavement and found ourselves a good spot to watch the ‘Let It Snow’ parade. By the time we finished watching the parade it was completely dark. You can’t really see much when it’s dark except for the dazzling Christmas lights and decorations. 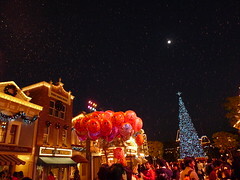 We hang around on the Main Street, USA to enjoy the falling ‘snow’ decending from the ceiling. They were actually tiny bubbles but the after effect was really good. Just as real as snow falling from the sky. We saw many kids jumping around happily. I guess kids and bubbles can never be separated. It really does give the wonderland feel. We didn’t Q for any ride. Instead, we spent time leisurely exploring the park. We had our dinner at The River View Cafe at the Adventureland. Food wise, it was just average but we enjoyed the peace away from the crowd at the main street. Though Ryan did not eat much, he did not make a fuss. He kept himself busy with his Ultraman toys (again). We enjoyed our meal peacefully. After our meal, we walked a bit more and decided to go back to the hotel for a good night rest as it was turning quite cold. We called it a day. Hahaha.. that was how we wasted spent our first night in Disneyland. 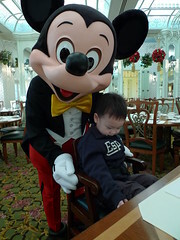 We woke up early for our ‘Meet The Disney Characters’ breakfast at the Enchanted Garden Restaurant. Ryan was very shy if not afraid when he saw the characters. He kept looking away when the characters approached. It took him awhile to warm up. The breakfast doesn’t come cheap but it’s all worth it. They served scrumptious spread of buffet and importantly the opportunity to take pictures with the characters without having to Q. After breakfast we wasted no time and went straight to the park. We rented the stroller again as it was just too tiring and too much of a hassle to carry Ryan. He simply refused to walk and insist to be carried nowadays. We toured the park like any tourist would. 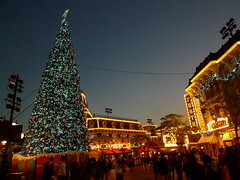 We walked a bit on the main street then went for the HK Disneyland Railroad. After the train tour, we decided to check out FantasyLand. We went for a few rides here and there and by around 1.30pm, Ryan was showing signs of sleepiness and we decided to go back to the hotel for our nap again.We went back to the park at about 4pm to check out what’s on Tomorrowland and Adventureland. We went for the jungle cruise and a few more rides here and there. 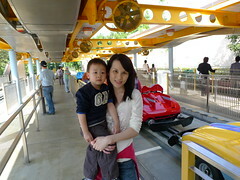 Our favourite ride has to be the Autopia (electric car ride). Ryan had so much fun on it. After our dinner at Plaza Inn, the crowd started to pull in. Everyone were waiting anxiously for the dazzling fireworks to start. We too, did not miss the fun this time. We found a spot and waited patiently for the clock to strike 8pm. That was when the sleeping beauty castle light up and the fireworks show started to fire the minute the song ‘A Whole New World’ was played. 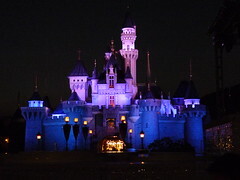 The castle was so beautiful under the lights of fireworks. You literally see the sky burst into a kaleidoscope of colors and lights while your ears being entertained by disney themed songs. I did not keep track how long the fireworks lasted. I think it was about 10 mins or so. Ryan was totally mesmerised. He kept himself busy with the hologram viewer (you could actually see snowman if you use the hologram to watch the fireworks). My hands were totally numb from carrying this 14kg boy but the beaming look on his face wiped all my tireness away. It was all worth it. After the show we headed back to our hotel. That’s about it on our second night. We had a quick breakfast at the hotel. Our park tickets only allow us two days’ entrance so on this 3rd day we decided to check out what’s in the vicinity of the hotel. Nothing much. There was a heated pool and a small playground nearby. We walked a bit further and were pleasantly greeted by a beautiful view at the waterfront promenade.After a short walk we decided to check out. We ordered a cab from Disneyland to our hotel in Kowloon. 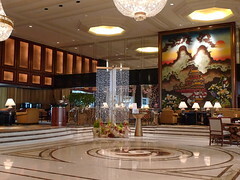 After about 20 mins ride, we reached Shnagri-la Kowloon hotel.Service was excellent at the front desk. 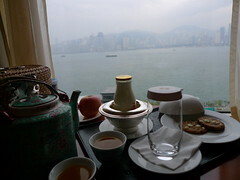 Generally I find service standard in Hong Kong very efficient and attentive. Singapore is not bad though may not be as efficient. It’s an unfortunate the same could be said about the service in my own home country. 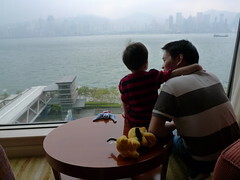 As soon as we stepped foot into our room, we were awed by the beautiful Victoria Harbor view that greeted us. I absolutely love my room. They definitely lived up to the expectation being an award winning hotel known for legendary warm and friendly hospitality. I’m a happy guest for sure. 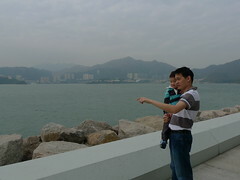 After refreshing ourselves, we took a stroll along the harbor across the road. We walked pass a stretch of hand imprints set on cement on the ground by Hong Kong stars. This is Hong Kong’s very own Avenue of Stars.We had McDonalds for lunch. Ryan definitely need more solid in the stomach. 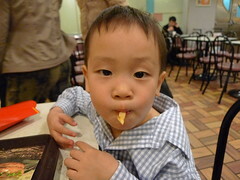 He munched down lots of fries and nuggets. 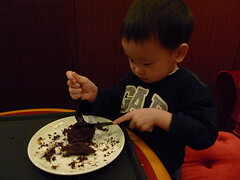 Not very healthy food but then… so long he eats. In the late afternoon I went for my shopping spree while the boys nap. I came back to the hotel 2 hours or so later to be greeted cookies and tea complimentary from the hotel. What a view to enjoy our tea break..Aren’t we spoiled??? At night we met up with Misha and family for dinner. We’re relatives but never really got in touch until there’s such a thing call blogosphere where we found each other. What a small world. 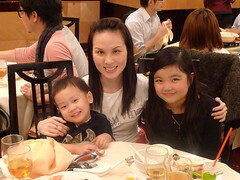 Misha family brought us to Yung Kee Restaurant (a Michelin 1 star restaurant) near Lan Kwai Fong for dinner. The food was super yummy. Misha daddy insisted I should try the century egg. I have never been a fan. After a small bite, I surrender. Hehehe… anyway, hubs said they were yummy. We went to The Peak early in the morning. 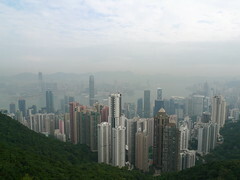 I wasn’t too keen but hubs insisted because the last time we went up the peak many years ago, it was at night. So this time round, hubs was adamant to catch the view at day time. We didn’t do much the rest of the afternoon. Didn’t do much shopping either since they sales in Hong Kong were pretty much on their winter clothing. At night we met up Jane, my ex Uni Mate. 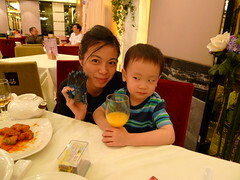 She brought us to this toy shop in Mongkok that sell lots of Ultraman and monsters. We stocked up a fair bit of them incl those Ultraman shows in Cantonese language. Ryan was sure a happy boy. 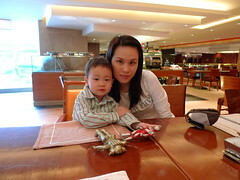 We had breakfast in the hotel as we were simply too lazy to go out. We had simple breakfast at Cafe Kool. Not so ‘cool’ place to have breakfast considering the price we paid. 2 american breakfast and a bowl of cereal for Ryan cost us about HKD400! The coach came to pick us up at 11am to the airport. Our flight was at 2.30pm. When we reached the airport, the Q already started to build. We were asked to proceed to the fast track lane since we’re travelling with a tot. There were about 4 passengers in front of us yet we waited for like 30 mins before our turn. Speaking of fast track??? Overall it was a good trip. Ryan seemed to enjoy himself very much too especially at Disneyland. Until today he still insist of watching the videos we recorded again and again.